If the regular season is any indication, New England Women’s Regionals will be tough to call. The region’s standing champion, Tufts Ewo, was the third ranked team in the region, relying on Northeastern Valkyries and Harvard Quasar to win the region its two bids. However, at Conferences, Tufts topped Northeastern and snagged the NE’s number one overall seed. Last year’s game to go loser and an undefeated team both also await in the field. Like many of the one bid regions, the reigning champ has been fairly dominant. In fact, Tufts hasn’t lost a game at Regionals since the redraw, and Ewo will look to extend their streak to four straight titles in Hanover, NH. To do it, they’ll have to navigate a New England minefield. Northeastern followed up last year’s surprise trip to the College Championships with a very strong 2014 regular season. They were able to take down good teams, challenge great teams, and make it to the final of two of the east coast’s strongest tournaments, and the semifinals of yet another. “My hope is that we’ve already dealt with enough pressure this season that we won’t be as effected as teams normally are,” said Northeastern Coach Jason Adams. The jury is still out on the early returns, as the Valkyries failed to bring home the Metro Boston Conference title, losing in the first round of the round robin format to Ewo, 12-8. It marks the third time this year Northeastern has finished second at a tournament. Even their wins were a little messy, with narrow margins over both Harvard and MIT. It looks unlikely Northeastern will be challenged in pool play, setting up a semifinals showdown against Harvard should seeds hold. The loser will be forced to fight through the backdoor bracket, potentially to face the winner again in the game to go. 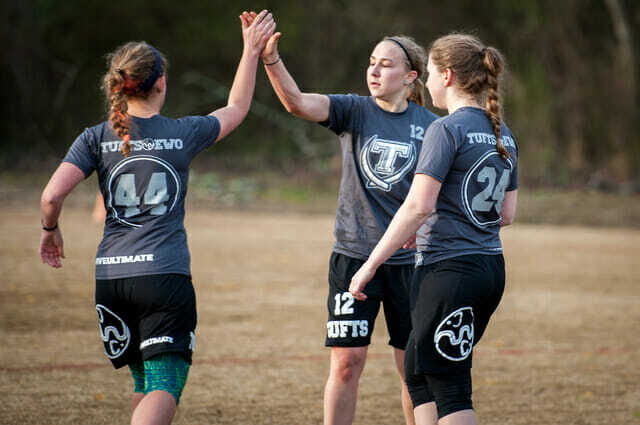 The Valkyries will be looking to Kate Flood and Lizzie Jones to run their offense with their disc skills and Mei Bruist to churn out yardage. Expect Jenni Ladutko, Hannah Walter, and Nicole Canning to also play notable roles. Northeastern’s big tournament experience at Florida Winter Classic, Queen City, and Centex has made them capable of navigating various strategies with aplomb; they are tough to throw off their game. The first step will be to make it to the big game. After that, it’s up to Northeastern to decide if they can win it. Northeastern and Harvard were the talk of the regular season, but that season is over. As far as the NE knows, the post season belongs to Tufts Ewo. They’ve already planted a flag on their turf by grabbing the number one seed and expectations are for nothing less than to win yet another Regionals. Expectations haven’t exactly been kind to Tufts this year. Their very talented and balanced roster has yet to pull in the big wins they are capable of: their best regular season win is 15-12 over Colorado from QCTU, followed by a 12-5 routing of a backsliding UCLA squad at Northwest Challenge. Execution issues plagued their offense, leading to unforced errors coming at the worst of times. Now that the Series is underway, Tufts may be turning the corner. Their 12-8 win over Northeastern at Conferences bodes well. There has never been a question about the talent the team possesses, but rather their ability to bring it all together. The roster is flush with strong elements. Emily Shields is likely to be voted Player of the Year in the region. Michaela Fallon and Mia Greenwald are experienced vets, while Qxhna Titcomb and Alex Earle are reliable playmakers. Add in Laura Fradin, Jojo Emerson, and Hannah Garfield’s disc skills, and the equation should add up to a potent Ewo team. Could the issue lie in a small rotation? Every pull goes up with a number of those notable names on the line. Many would assume that playing with the same group would facilitate the kind of chemistry that reduces unforced errors, but perhaps fatigue is playing a role. That shouldn’t be a big factor for Tufts at Regionals. If they play their cards right, they won’t faces more than two challenges in a row – bracket play – but if they stumble, they could find their depth tested. Environments like that can bring nasty habits to the forefront. It’ll be in Tufts best interest to win cleanly and avoid grinding out games Sunday. Harvard finished the regular season ranked 16th by USAU, enough to earn a critical second bid for the NE. The placement raised questions about whether or not their ranking was really earned. They had only one marquee win, 14-13, over a depleted Michigan team at President’s Day Invite. What Quasar did do was cleanly dispatch all of the midlevel competition they came across. That includes surprise nationals qualifier Cornell, along with Florida, Alabama, San Diego State, and Southern California. Now they’ll have to prove they can win against top flight competition, because it is unlikely the road to nationals won’t go through one of Tufts or Northeastern. Before taking on those challenges, Harvard will have to fend off teams looking to snake the bid they brought home. Dartmouth, Middlebury, and MIT are all eagerly eying the New England third seed like hyenas stalking an injured gazelle. Harvard’s got the top end talent to be more aptly compared with healthy beasts of the wild. India Stubbs remains a force, a lengthy thrower with vaunted disc skills and field vision. Graduate student Shirlee Wohl is another one of the region’s best players and Vivian Chan will also be key for Quasar’s potential bid defense. Containing Harvard’s stars is difficult and crucial. The second bid for the region really opened up the doors for many teams. Fighting through two or three of the top teams is asking a lot, but beating one at the right time? Much more manageable. First in line is Dartmouth, the fourth seed at the tournament and the last one seed. Princess Layout is in a similar position to last season, when they had the chance to break through the backdoor bracket. But Middlebury had other ideas, defeating Dartmouth on double game point in the backdoor semis. They’ll see Middlebury again in pool play Saturday. Dartmouth’s results from this season don’t look that much different from Harvard, but they lack the big time win. They’ve wrecked a lot of low level competition and took on one highly competitive tournament – QCTU – leading up to Regionals. The pieces are there on the roster, headlined by the forceful play of Petzinger. Adding starpower to the roster in the form of freshman Angela Zhu didn’t hurt, and neither did acquiring the athleticism of freshman Piper Curtis. But the experienced play of players like Eisner and Patty Neckowicz could be what pushes Princess Layout over the top. After Dartmouth, two more characters are looking to steal the stage in Hanover. The Middlebury Lady Pranksters are always dangerous. They upset Dartmouth to make it to go the game to go last year – where they were stomped by Northeastern – and are capable of making it back. They are undefeated this year, including a 7-6, and entirely upwind-downwind, win over Northeastern at a round robin. Aly Fassett-Carman is unquestionably one of the best women in the region and gives Middlebury a chance in any given game. Hayden Shea, Grace Benz, and Clara Gottesman hav the ability to offer support. On the whole, they should make Pool D worth watching, and could make noise beyond pool play. MIT Smite hasn’t had the regular season success of the teams seeded above them, but the sixth seed put together some good runs at their Conference Championships that indicate an upset is possible. Michelle Rybak and Lisa Liu will lead this underdog crew, and if they manage to ruin someone’s weekend, it’ll like be on the backs of these two. There’s plenty of intrigue to be had in New England and divining a winner is no easy task. Picking against Ewo would be fun, but they’ve got history and recent results on their side. They should be able to take the region again. Northeastern has done enough to prove they are the real deal, but Dartmouth is a very scary four seed. Princess Layout is capable of upsetting Harvard and pushing the Valkyries to the edge. Northeastern’s big game experience and depth will help them survive under pressure and continue their string of second place finishes. Only this one will send them to Nationals. Comments on "2014 D-I Regionals Preview: New England (Women’s)"